I had a very specific feel and sound in my head when it came to the perfect guitar. After seeing Shabat’s work, I knew that they could deliver. I did some research and talked to the builder directly and they made me feel confident to order sight unseen. Let me tell you, their Lion DX model is absolutely killer. I always loved Tele Deluxe style guitars, and theirs is the perfect blend of class, beauty and playability. It’s my go-to guitar now, even over my custom shop Les Paul! 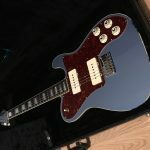 I currently own two Shabat Guitars and both are my prized possessions … You will not find a better builder or more inspirational guitar than a Shabat Guitar.